ND Brown have been in the truck rental and sales business for over 30 years and supply a wide range of specialist HGV hire throughout the country via our three depots. HGVs are an incredibly important part of many businesses for both maintaining road safety and supporting construction projects. We’re experts at supplying our HGV hire to strict timescales and deadlines and can provide HGV hire for short, long and open ended contracts. Our hire division operates a fleet of over 450 vehicles, and our HGVs are available in a variety of sizes which suit both large and small projects. All of our HGV vehicles are maintained to the highest standards and this ensures that you receive durable, efficient and reliable HGV vehicles for your project or business. To make the process even easier we also provide a delivery and collection service, which is particularly useful if the project is large and logistics are complicated. If you would like to learn more about our HGV hire vehicles then please take a look at the specifications of our HGV fleet below. Alternatively, get in touch with our expert team who are on hand to help you with any questions or queries you have, and can help to advise you on which of our HGV hire fleet would be best suited to your project. We regularly supply to customers countrywide, so wherever you’re located, get in touch to see how we can help you. For your peace of mind, we are members of several regulatory organisations, such as Constructionline. Our hot box HGVs come with a range of features including side tipping bodies, propane gas heating systems, electronic gas ignition systems as well as digital temperature control. From 7.5 tonne HGVs, through to 26 tonne GVW hot boxes, our range ensures all projects are catered for. Furthermore, we can help you decide which HGVs are best for your project. Our HGV tippers are used for a variety of projects; from home renovations, through to commercial construction projects, as well as being ideal for jobs of all sizes. Furthermore, our tipper HGV hire options come with steel dropside bodies and tipping bodies dependant on their size, to make transporting heavy goods simple. 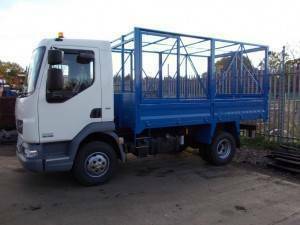 Tipper grabs are an integral part of construction projects as well as maintenance. Moreover, they add an extra element to the standard tippers, with a choice of cranes. These HGV vehicles are suited to heavy lifting and construction projects and also come in a range of sizes dependant on your requirements. Cage tipper HGVs provide more support and capacity than a regular tipper by integrating a cage to the tipper body. The cage tippers function in the same way as regular tippers, and are often used by building and trade industries to carry large or fragile cargos.